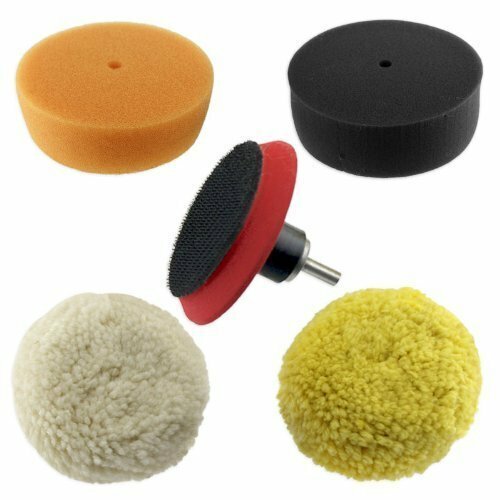 Buffing and polishing pad set for getting a shine on your favorite ride so deep it looks like you could dip your finger in it. Unique backing pad design works with more power tools: angle griders/sanders, cordless or corded drills, die grinders. Coarse (white) and fine (yellow) 100% lamb's wool pads have excellent cutting power for removing paint oxidization and scratches. Open-cell foam (orange) pad polishes out swirl marks/holograms and closed-cell foam (black) produces ultra-gloss shine finish. Unique beveled-edge design provides superior coverage to protect paint against scratches caused by contact with backing pad. Industrial-hold Hook & loop keeps pads in place yet allows for quick pad swaps. Pads have 1/4" arbor holes and can also be used with screw-type mandrels. If you have any questions about this product by Pro Tools, contact us by completing and submitting the form below. If you are looking for a specif part number, please include it with your message.